This pattern set includes 5 baby toy patterns! 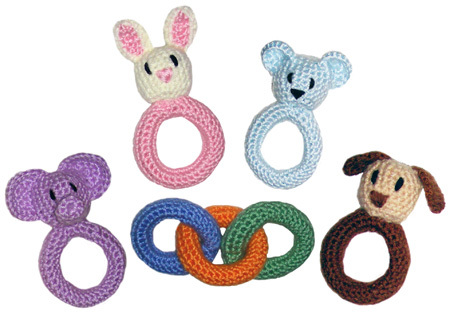 Crochet all four animal baby rattles (bunny rabbit, dog, elephant and teddy bear) and the colorful chain ring toy. Some embroidery skills are required. Download this pattern now at the Crochet Spot Store. Free to download for all Premium Pattern Members. If you need help crocheting these adorable baby toys, let me know and I’ll be glad to help! This entry was posted on Sunday, September 27th, 2009 at 12:40 AM by Rachel Choi	and is filed under Best Crochet Patterns. You can follow any responses to this entry through the RSS 2.0 feed. You can leave a response, or trackback from your own site. My niece is gonna love these!!! I’m gonna go download right now. Hi, I’m Denisse but i don’t live in the united states, i can speak english but sometimes i don’t understand some expressions of the language so even this is not the right place to ask could you please tell me what wave in ends means? I love these! They are so cute. I can’t wait to try these out. Rachel, I just love visiting your site! These patterns are adorable! I can’t wait to make them for my grandchildren.